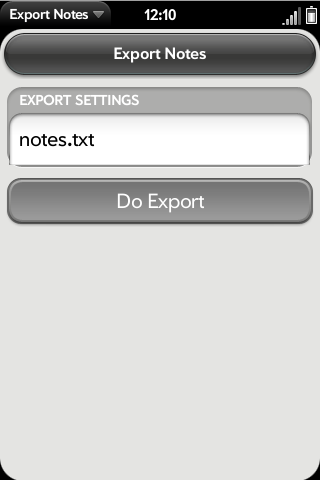 This app exports all your notes from the notes / memos app (or better the internal database) to a text file with tabulator seperated fields for: create timestamp, human readable create timestamp, modified timestamp, human readable modified timestamp, color, title, text. This file is saved in the usb partition and can be send as attachement per E-Mail (from the app menu). It should be easy to import that file to Excel. This way one can backup and/or export all the notes from the device and keep them, even if webos goes down or the palm backup server dies someday. Just press "Do Export" and wait for the spinner to stop spinning and the message "All went well". If you get a "Permission denied"-Error, please execute the command line from above or tripple-check if the patch is installed and that you rebooted the phone after the patch installed. After that hook up the device to an USB port and copy the created file or use "Mail notes" from the app menu and e-mail the notes file to yourself. You can change the filename in the text editfield. But there is no real reason to do so.